provide a forum to accomplish all this – and more. Are you on our map? 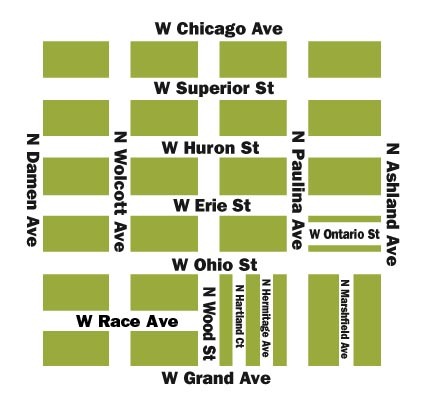 If you live within CGNA boundaries – Chicago, Damen, Ashland and Grand Avenues – please join us. It’s such a small commitment for such a rewarding experience of truly being part of a growing, thriving neighborhood. Next CGNA meeting will be April 16th (Tue). It will be held at Output Lounge – corner of Wood and Grand streets. P.S. If you’d like to receive our monthly e-newsletter, learn more about CGNA, including upcoming meetings, events or how you can help support our neighborhood, please contact us at cgna@cgnaweb.org, or find us on Facebook. Lyn Wolfson, President of CGNA has reached out to people to try to find out who owns the property and who was affected. She posted on CGNA Facebook page asking for volunteers to help organize how to help. One neighbor has volunteered to help find contact information and to help organize. Lyn will share with the community whatever she learns. CGNA is a community organization and it takes the participation of members of the community to help each other. The board is a governing body made up of volunteers who live in the community. It is people like you and all neighbors who must step up and help organize, help activate, participate in helping neighbors like the victims of this fire. Please let me know what CGNA can do for residents displaced in the Ohio Street fire Sunday night?